Sometimes referred to as a Water Atronach, this magically enchanted creature causes not only damage from its vicious attacks, but also from the extreme cold aura it generates. Some are artificially constructed as a sort of golem. Others are actually daedra, akin to the Frost Atronach. Ice Atronachs are immune to cold based spells, which actually heal the creature. They are also immune to normal weapons, but have a weakness to fire-based attacks. They are often summoned by mages, and can be hunted as a source of Frost Salts. A weak variety of Golem, created out of ice. 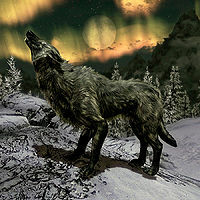 A type of wolf native to the colder regions of Skyrim. 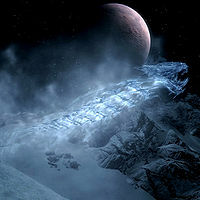 Spirits native to Skyrim, Ice Wraiths are traditionally hunted by young Nord warriors as a rite of passage, so that they may claim full status as citizens. Their fast speed and near-transparency makes them a tough challenge in numbers. Also spelled Ilyadi. Faeries once native to Summerset Isles, that were giants taller than trees, with eyes that cover their head. A gold-colored variety of monkey. It is unknown if they have any relation to the Imga. Imps are small, winged humanoids who are slightly intelligent and can cast a variety of spells. Speakers of Impish can tame these creatures. The Homonculus is physically similar to the Imp. The origins of the Imp are not clearly known. Some sources suggest they may be Daedric beings, while others state that they are artificial constructs similar to golems. It may be that both theories are correct. 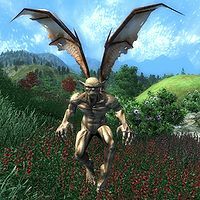 Imps were among the first beings summoned from Oblivion during the development of Conjuration magic, suggesting at least some of them are Daedra. The Imperfect is a factotum variant designed with advanced combat features. A new prototype is created and is improved upon each time it is destroyed. Sequence plaques are collected to be analyzed for their data after each combat test so further advancements are made. One day it shall obtain its true form, and fulfill its ultimate goal. Around the 2E 582, the Vestige encountered and defeated several Imperfect factotums during their journey in the Clockwork City within the Asylum Sanctorum and the Sanctuary of Verification. They were aided by one in the Ventral Terminus. In the Third Era, Two of these giant constructs were created by Sotha Sil for the purpose to guard him in his Clockwork City. Only one was functional during the Nerevarine's venture to the Clockwork City in 3E 427; it attacked the Nerevarine and was defeated. 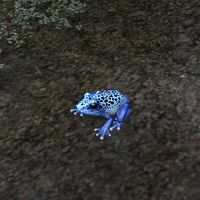 The Indigo Tree Frog is a species of Tree Frog found in Murkmire, which are used by Argonian vossa-satl makers to create the instruments unique sound. They are blue in color with black spots and live in groups, nesting in the high branches of trees and only come down to feed on insects such as Fleshflies. Indriks are magical creatures that bear some relation to Jephre. 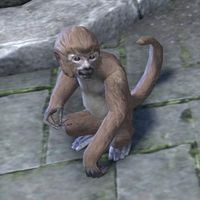 They can be found throughout the forests of Summerset Isle and are often hostile. Indriks can be summoned to Tamriel by combining four legendary feathers. Indriks follow an evolutionary pattern and has four forms. The indrik first enters Tamriel in a pure form, and are referred to as Nascent Indriks. Further exposure to some infused stimulus will change its form and cause it to evolve, developing secondary characteristics and more specialized antlers. 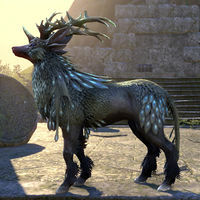 The second form is referred to as a Dawnwood Indrik and its antlers grow and develop a green glow. Its plumes also develop a green color. A type of saltwater fish that can be found off the coast of Bleakrock Isle and Bal Foyen. Also called an Earth Atronach, this creature damages anyone who dares get too close to it from its magical aura. Electricity based spells do not damage but heal it instead. It can be harmed by any type of weapon. 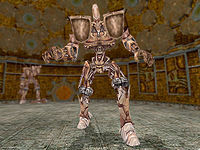 Some Iron Atronachs are artificially constructed as a sort of golem. Others are actually a variety of daedra. 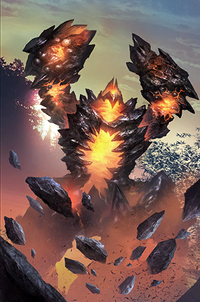 A powerful variety of Golem, created out of iron. This page was last modified on 7 March 2019, at 20:47.